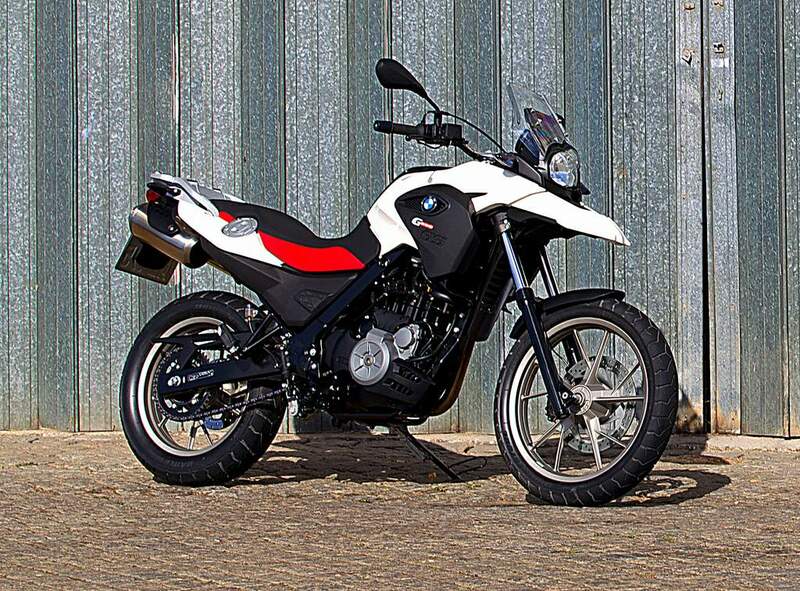 BMW G 650 GS - the success story of the BMW Motorrad single-cylinder engine continues. 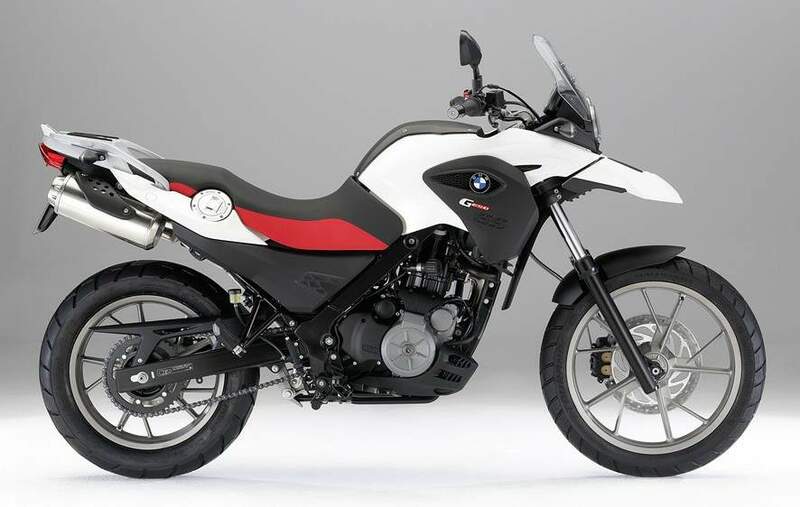 With the new BMW G 650 GS, BMW Motorrad has added yet another attractive member to its BMW GS family. With its lean, wiry offroad stature, the new single-cylinder enduro cuts a cheeky, light, and adventurous figure. At the same time it stands out clearly from its rivals in terms of quality, equipment, and comfort. In conjunction with its relatively low weight and the low seat height, it presents an attractive means of entry to the passion of motorbiking and the fascinating world of BMW GS adventure. New edition based on a tried and tested platform with high torque and low consumption single-cylinder engine. The new G 650 GS has opted for a technology on a widely used basis: the popular and successful BMW F 650 GS with single-cylinder drive of many years' standing. This liquid-cooled single-cylinder engine with double overhead camshafts has a displacement of 652 cc, delivers 35 kW (48 hp) at 6500 rpm, and develops a maximum torque of 60 Nm at 5000 rpm. As an optional accessory, the vehicle is also available in a power reduction version, delivering 25 kW (34 hp) at 6500 rpm and 47 Nm at 4500 rpm. Thanks to electronic fuel injection, twin-spark ignition, the high geometrical compression ratio of 11.5:1, and a closed-loop catalytic converter, this tried and tested single-cylinder engine is designed for the maximum level of riding pleasure with the best possible efficiency and high environmental compatibility. It shines forth with exemplary low consumption values of, for example, only 3.2 liters per 100 km at a constant 90 km/h. In conjunction with the claw-shifted five-speed gearbox, the free revving single-cylinder engine in the new BMW G 650 GS provides for a thrilling experience, in particular on snaking country roads. Its beefy torque curves and good response also allow detours handled with supreme ease beyond the asphalt of roads. Robust suspension technology for great riding pleasure on the country road and on easy terrain. The suspension of the new G 650 GS was developed primarily for running on country roads and takes the form of an agile chassis with a bridge frame of steel tubing and a bolt-on framework tail that has already seen excellent service on the earlier BMW F 650 GS. Whereas the front wheel is controlled by torsionally rigid telescopic forks, the rear system takes the form of a solid dual swing arm of square steel sections in conjunction with a monoshock linked via a lever system. Besides the optimal riding stability up to the maximum speed of 170 km/h (power reduction 145 km/h) the new G 650 GS presents a thrilling performance of playful handling on the country road. Adequate spring travel ensures a high level of riding comfort and appealing off-road qualities despite its low seat height. Powerful deceleration is provided by the brake system consisting of a single brake disc at the front and rear. 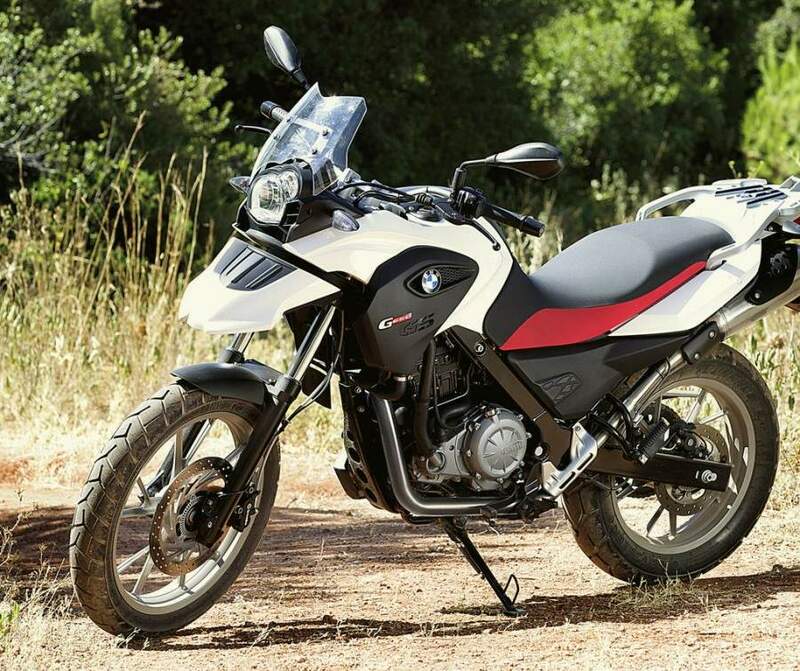 The BMW Motorrad ABS, available as optional factory-fitted equipment, can be deactivated for off-road riding. 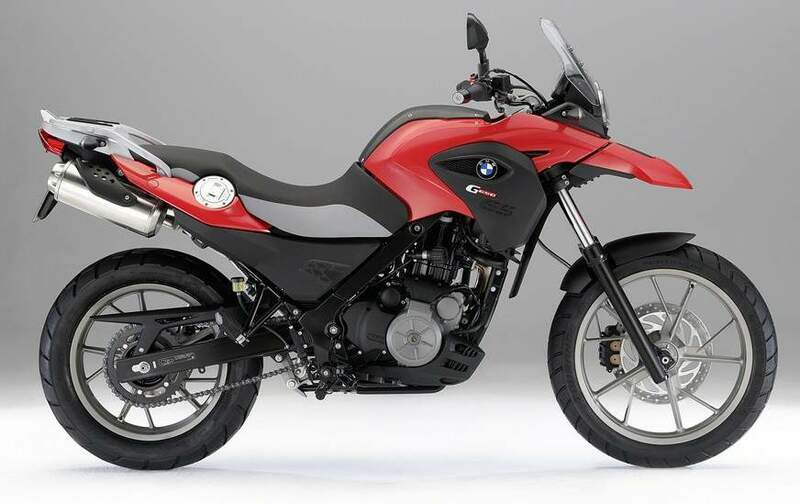 Typical enduro design and colour concept in the style of the BMW GS family. The body of the new G 650 GS was completely redesigned. In particular the front section makes the single-cylinder enduro light, sporty, and dynamic. The asymmetrical headlamp and the self steering front wheel cover give the G 650 GS its look of absolute independence. A clear design of lines, the targeted use of coloured areas and all black plastic parts uphold the visual impression of a robust enduro outfit. 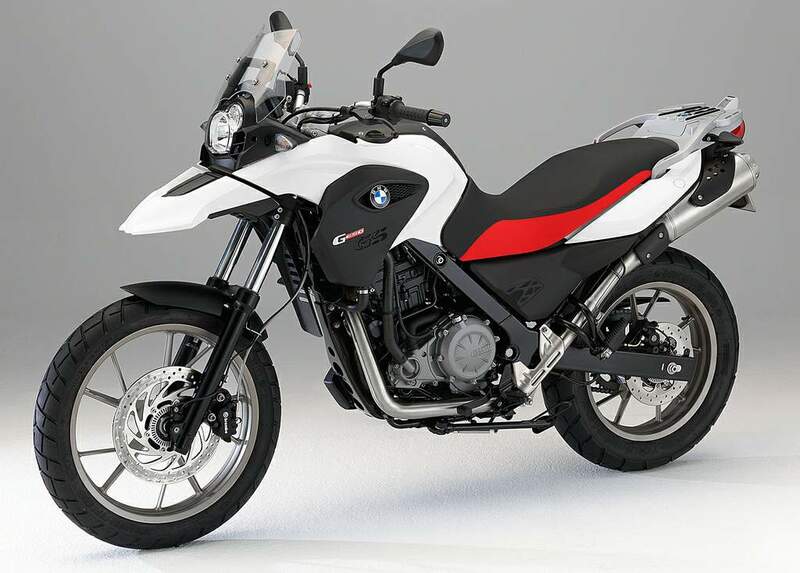 The overall impression of sportiness is boosted further by the engine, exhaust covers, frame, swinging arm, and slide tubes, which are all black, contrasting with the plain colours of aura white and orange-red as well as the matching two-tone seats.The new BMW G 650 GS will be produced at the BMW Motorrad plant in Berlin Spandau. • Reliable, high torque, and low consumption single-cylinder engine with 652 cc displacement. • Tried and tested suspension concept with bridge frame and swinging arm of steel, telescopic forks, and monoshock (spring travel front 170 mm, rear 165 mm). • Cast light alloy wheels in new design. Diameter front 19", rear 17". Wider rear wheel rim for even better riding stability. • Stable brake system with single brake disc at front and rear and OFF/ON BMW Motorrad ABS (optional factory-fitted equipment). • Redesigned body scopes incl. windshield with GS moulding and two-tone seat. • Lean and ergonomic 14 litre tank. • Three different seat heights: standard 780 mm, low slung 750 mm (as optional factory-fitted equipment), high seat (black) 820 mm. • Sporty cockpit design with asymmetrical headlamp and instrument panel. • Luggage carrier with lockable storage compartment. • Extensive optional factory-fitted equipment: BMW Motorrad ABS (ON/OFF), heated grips, anti-theft alarm system, centre stand, socket, low slung. High torque, economical single-cylinder engine for dynamic riding pleasure and great riding potential. 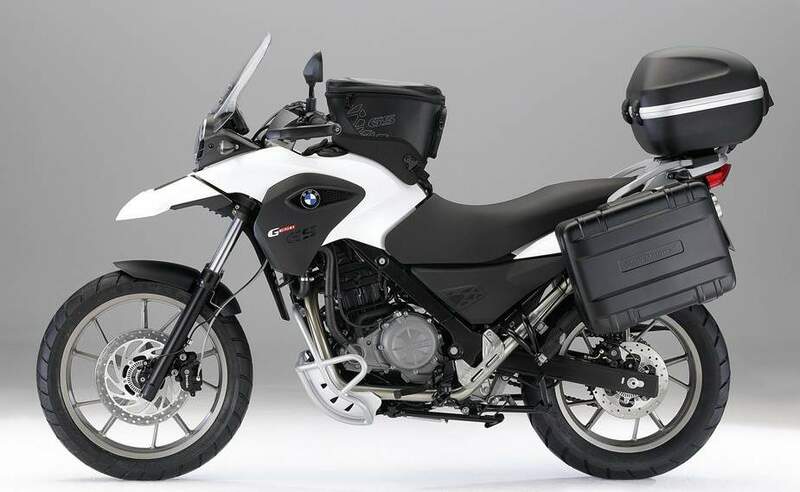 The heart of the new BMW G 650 GS is the 652 cc single-cylinder engine with four valves, double overhead camshafts, electronic fuel injection, and twin-spark ignition, known from the BMW F 650 GS built until 2007. With a power output of 35 kW (48 hp) at 6500 rpm and a maximum torque of 60 Nm at 5000 rpm, and this coupled with its low weight of only 192 kg with a full fuel tank, it is the perfect dynamic partner especially on country roads and easy terrain. Owing to the new driving licence regulations that are currently in force in Spain and that will be enforced in all other EU member states in early 2013, the ECE version of the G 650 GS was homologated for a power output of 35 kW (48 hp) and a maximum torque of 60 Nm. For new licence holders in the EU outside of Spain, there is a power reduction version delivering 25 kW (34 hp) as a retrofit option. Exemplary running smoothness, not self-evident in the single-cylinder segment, is ensured by a counterbalance shaft that extensively suppresses vibrations. In conjunction with a closed-loop catalytic converter and the engine controller BMS-C II, vehicles fitted with this engine and its twin-spark ignition conform to the applicable emission regulations. Further practical benefits of this technology are the ride comfort, throttle response, and remarkably low fuel consumption. With a compression ratio of 11.5:1, the engine is designed for a fuel quality with an octane number of at least 91 RON for a convincing range of low consumption values. At a constant 90 km/h, for instance, the consumption is only 3.2 liters per 100 km, so ranges of 350 kilometres and more are possible. A regulated heat balance in the engine is ensured with 1.3 liters of coolant. The coolant level can be checked easily using the inspection window integrated in the GS inscription on the left side. Power is transmitted by a claw-shifted five-speed gearbox. As usual for the enduro segment, the secondary drive is transferred via an O ring chain. For optimal acceleration, particularly when starting off or overtaking, the enduro features a secondary ratio that with 16/47 teeth (1:2.937) is relatively short. Safe suspension handling with the ideal combination of country road and offroad qualities. For high torsional resistance and a robust quality typical of enduros, the new BMW G 650 GS has opted for a tubular bridge frame of steel sections with bolt-on framework tail. The dual swing arm is supported against the frame via a monoshock and lever deflector and is likewise made of a stable square steel section. Superior riding stability up to the maximum speed is assured with the telescopic forks fitted with a fork stabiliser and a fixed fork tube that is 41 mm in diameter. The spring travel is 170 mm at the front and 165 mm at the rear (low slung 140 mm / 130 mm), so moderate seat height is united with off-road practicality that is suitable for easy terrain. Even easy off-road rides are mastered with ease by the redesigned cast light alloy wheels fitted as standard. For improved riding stability at higher speeds, the rear wheel rim was widened from 3.0" to 3.5". Tyres in the sizes 110/80 R19 59V and 140/80 R17 69V are fitted on the 2.50 x 19" front rims and the 3.50 x 17" rear rims respectively. The chassis of the new BMW G 650 GS is designed for the greatest possible agility and carefree cornering pleasure on country roads, but without sacrifice to either comfort or travelling practicality. The high degree of riding stability, steering precision, and handling inspire confidence even in first time motorbike riders. Featuring a 300 mm disc brake at the front and a 240 mm disc brake at the rear, the brake system of the new BMW G 650 GS is designed for stable and easily controllable deceleration. As part of its optional factory-fitted equipment, the BMW G 650 GS also offers an ABS system and so even greater safety in braking manoeuvres. 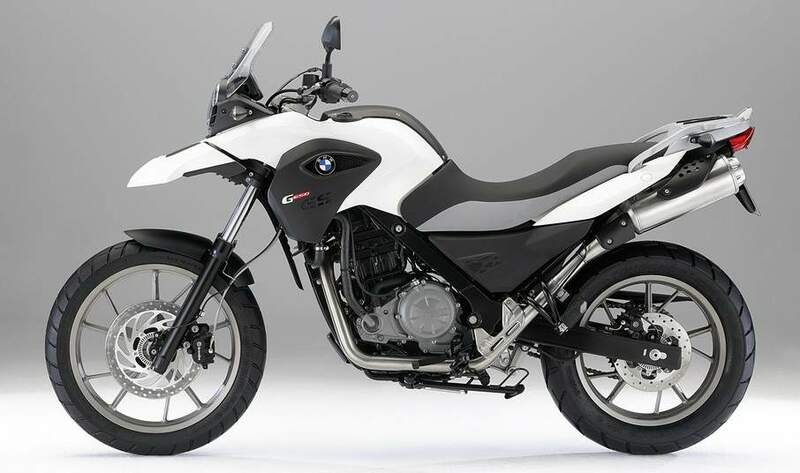 For offroad riding, the BMW Motorrad ABS can of course be deactivated. Perfected ergonomics for unadulterated enduro pleasure. Since the very outset, the single-cylinder models from BMW Motorrad have been characterised by a compact design and easy handling. The rear tank with its low centre of gravity is a key contribution to the agile handling properties of the new G 650 GS. The new, particularly lean tank shape serves to improve yet again the inner leg length and therefore the ease of dismounting from the G 650 GS compared with the single cylinder F 650 GS. At the same time the leaner vehicle waist means that the rider can easily stand when manoeuvring offroad. For individual ergonomics, the new BMW G 650 GS comes with no fewer than three different seat heights. Besides the standard seat, the low slung suspension as optional factory-fitted equipment and the retrofit high seat make sure that virtually every motorbiker feels at ease on the G 650 GS. A relaxed seated position and the optimal vehicle control are provided by the new wide and ergonomically moulded handlebar. The clutch lever can be reconfigured to each rider's individual reach. At higher speeds the standard windshield perceptibly shields the rider's upper body from wind and directs oncoming wind over the helmet. For even greater long-haul comfort, a higher windshield is available from the range of BMW Motorrad optional accessories. Dynamic front section design with sporty cockpit. Completely new is the compact, flat instrument panel, consisting of an analogue speedometer and an LCD display with digital tachometer. This LCD display also presents additional information, such as the kilometres travelled, two trip counters and the time. For indicators, high beam, idling, fuel reserve, ABS, and engine temperature, the LEDs present a clear arrangement to the right of the round instrument. In addition, simple and safe handling is ensured by new, lean, multifunctional switches operated like conventional indicators. Modern, sporty design in the typical BMW GS look. The new BMW G 650 GS presents itself as an authentic member of the BMW GS family. Its lean, wiry look gives it lightness and rouses the thrill of adventure. With its clear play of lines and the deliberate combination of colour paintwork areas and black components, it cuts a purist figure with that touch of robustness typical of the enduro. With high quality technology and visual appeal, the exhaust system is presented in brushed stainless steel with black anodised covers. Optional equipment and optional accessories - the perfect potential for optimising the BMW G 650 GS. Even in the standard version, the new BMW G 650 GS justifies its claim as an almost perfect, light-footed, dynamic enduro. In addition, BMW Motorrad provides the usual extensive range of optional equipment and optional accessories for the further individualisation of the new BMW G 650 GS. Optional equipment is factory fitted and is integrated in the production process. Optional accessories are installed by the BMW Motorrad dealer, so the motorcycle can be fitted with options afterwards as well. • Also as optional accessory retrofits. • BMW Motorrad ABS (ON/OFF) incl. hazard warning flashers. • Low slung (seat height 750 mm). ** Also available as optional factory-fitted equipment. • Vario panniers in a new design. • Inner pocket for vario panniers. • Inner pocket for topcase. • Seat, high (plain black, seat height 820 mm). • Single seat with luggage compartment (plain black, seat height 780 mm like standard). • LED lamp for charging socket. • Power reduction 25 kW. Dynamic colour scheme in the GS character. 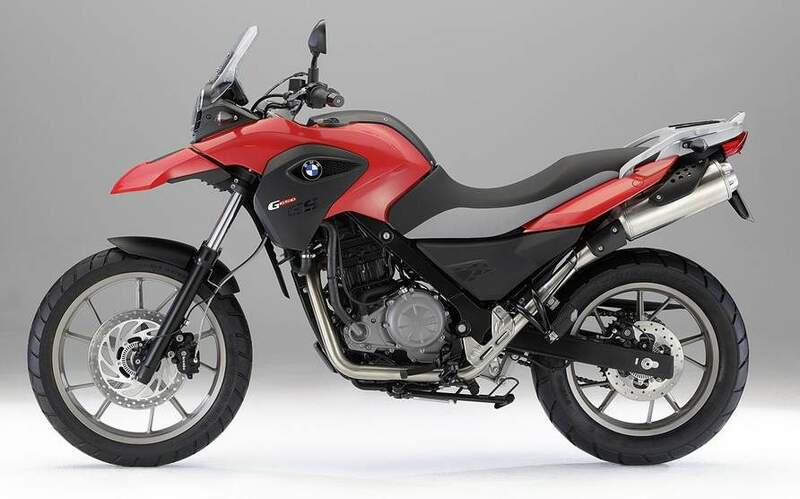 The typical enduro character of the new BMW G 650 GS is underscored by the colours plain orange-red and aura white. Exciting contrasts creating a dynamic impression arise from the interplay of painted body scopes and black elements like the engine, centre cover, exhaust covers, frame, swinging arm, and slide tubes. Contrasts and therefore touches of class are also presented by the Nurburg silver of the engine cover for alternator and clutch, the magnesium of the wheels, and the indicators with the smoky grey glass covers. 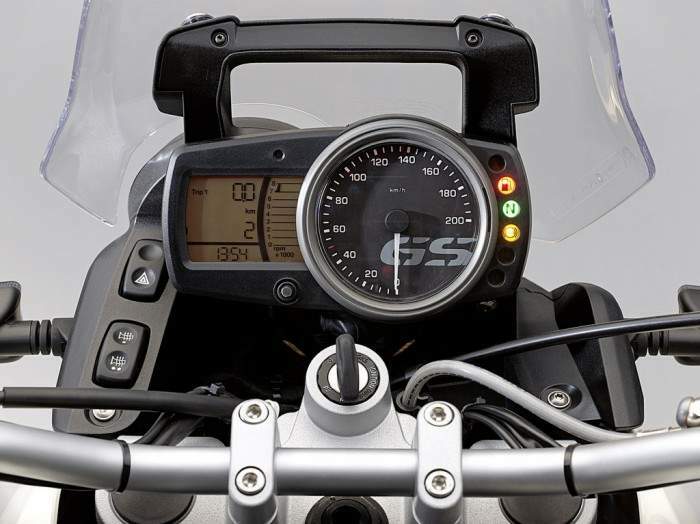 The dynamic appearance of the G 650 GS is underscored in the detail of the BMW GS inscription on the speedometer dial, the windshield, and the side badges holder. For the preferred personal taste, the two colour variants can be combined with one of two different colour schemes for the seat, either black/red or black/grey.